If your sump pump fails, you probably won’t know it until the worst possible time: after your basement incurs water damage due to flooding, a plumbing rupture or ground water infiltration. 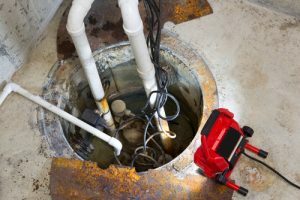 Because sump pumps are concealed inside a covered basin in the basement floor, a defective pump may not be obvious until that critical moment when it’s needed most. Run it. Because sump pumps often go extended periods without activating, some manufacturers recommend routinely test-running the pump every three or four months to confirm proper function as well as keep moving parts operating freely. Fill a 5-gallon bucket of water and pour it into the basin. Confirm that the float switch activates the pump. Make sure the pump empties the basin, and the float switch turns it off promptly. Also verify that water doesn’t flow back into the basin after the pump stops, reactivating the pump. This is a sign of a defective check valve in the discharge pipe which can shorten pump service life. Clean the sump basin. Pull the pump up out of the basin and clear out any debris. Also clean the pump inlet screen to ensure that water flows into the pump chamber. Check the GFCI outlet. Most sump pumps are plugged into GFCI (Ground Fault Circuit Interrupt) outlets. GFCI outlets may switch off due to transient power surges taking place without your knowledge. Verify that the outlet has not switched off and that power is still going to the pump. Observe pump discharge. Go to the outdoor termination point of the discharge pipe and make sure it’s not obstructed by dirt or other debris. Confirm that water flows freely out of the pipe. Check the battery backup. If the pump has a battery backup feature, unplug the AC power cord and confirm that the pump activates on battery power when water is poured into the basin. This entry was posted on Tuesday, September 11th, 2018 at 6:41 pm and is filed under Tips & Safety. You can follow any responses to this entry through the RSS 2.0 feed. You can leave a response, or trackback from your own site.